Keith Robert Andreassi DeCandido (born April 18, 1969 in New York, United States) is an American science fiction and fantasy writer and musician, who works on comic books, novels, role-playing games and video games, including numerous media tie-in books. Keith R. A. DeCandido's book Out of Tune was available from LibraryThing Early Reviewers. Keith R. A. DeCandido's book Sleepy Hollow was available from LibraryThing Early Reviewers. 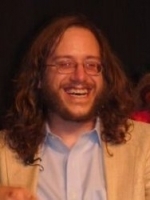 Keith R. A. DeCandido is currently considered a "single author." If one or more works are by a distinct, homonymous authors, go ahead and split the author. Keith R. A. DeCandido is composed of 11 names. You can examine and separate out names.